Foraging workers visit beautiful flower blossoms to collect nectar and pollen for the hive. Last week during our trip to Belize, we visited the deceptive owl butterfly and learned its tricks to fool would-be predators. This week Bug of the Week makes another stop in the rainforest to witness some close relatives of our domestic honey bee. While visiting a rest camp near the Mayan ruins at Xunatunich, we discovered several colonies of stingless bees occupying cinder block walls of a building. Small cracks in the mortar provided perfect entryways to the hollow cavities inside the block walls. Usually, nests of stingless bees are made inside hollow trees or in cavities below ground, but block walls apparently make highly suitable nesting sites for bees. 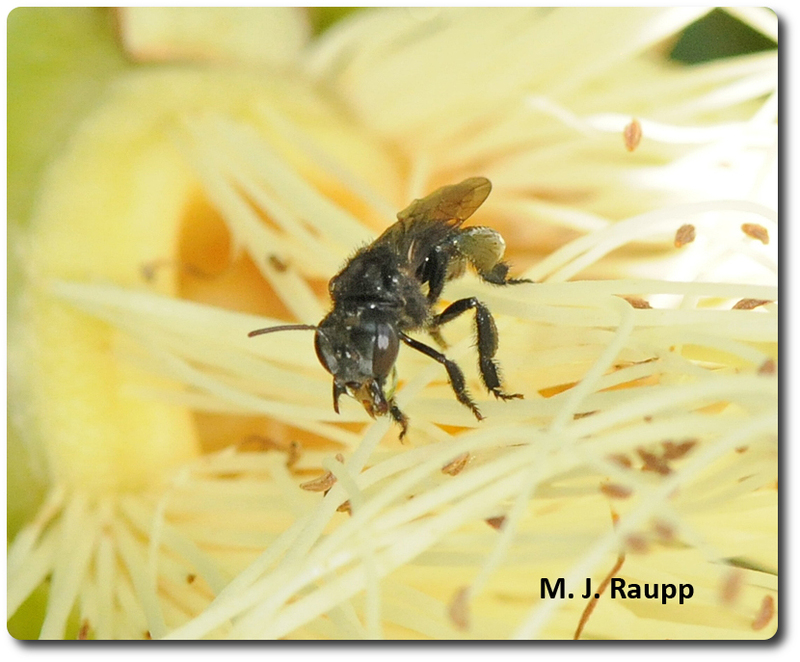 Various species of stingless bees live in colonies ranging in size from a few hundred to more than 80,000 workers. Trumpet-shaped entrance tubes lead to brood and honey chambers within the colony. The tubes are constructed of a sticky substance called propolis, a mixture of wax and other materials repellent to ants and other creatures that would love to raid the hive and plunder honey, pollen, and baby bees inside. Light colored bees known locally as Blondies went about their business seemingly oblivious of a nearby bug geek with a camera. However, a second darkly colored species nearby was not nearly as docile. The nest entrance was guarded by several workers that watched carefully and mounted a surprising attack when humans ventured too close. The assault consisted of dozens of workers flying into faces and grappling onto exposed skin. They seemed to pay special attention to eyes, noses, and ears. These stingless bees mounted a powerful attack when curious humans ventured too near. Although they lacked stingers, their annoying bites were very persistent and forced intruders to vacate the vicinity of the hive. In his book, “The Insect Societies,” E.O. Wilson describes accounts of stingless bees attacking human intruders. Some species eject an irritating liquid that can burn skin. This trick has earned them the local name of cagafogos or “fire defecators” in Brazil. This defense may be potent enough to dissuade very aggressive attackers like army ants from entering nests. Inside the colony, the queen busily fills brood cells with eggs. The life of a worker bee is a predestined regimen of tasks that change as the bee ages. For the first several days of life, worker bees are craftsmen, shaping and forming the basic building materials of the colony, wax and a wax-like material called cerumen. After a week or so and for several weeks thereafter, workers stock cells with food and have the heady assignment of feeding the queen. About this time they also begin to produce wax to build the many structures of the nest. Soon workers enter guard duty at the nest entrance. Blondie workers guard the entrance to their colony and return to the hive with food for their young. Shortly thereafter, they take on the assignment of collecting nectar and pollen for the hive. Worker bees are common visitors to many kinds of flowering plants in the Belizean jungle. When captured and rolled gently between two fingers, they emitted a pleasant floral odor. For centuries ancient Mayans maintained colonies of stingless bees as a source of honey used for sweetening foods and to produce a fermented drink similar to mead. Unfortunately, with the introduction of Africanized bees and domestic honey bees, the number of colonies of stingless bees has declined dramatically and husbandry of stingless bees is becoming a lost art. In addition, fragmentation and loss of natural forests in Central and South America threatens many species of marvelous stingless bees and the tropical plants they evolved to pollinate. Lee and Sarah provided the inspiration for this episode of Bug of the Week while enduring a remarkable attack by stingless bees. The fascinating books "The Insect Societies," by E.O. Wilson, and “Maya Beekeeping Tradition Fades,” by Stefan Lovgren, were used as references for this Bug of the Week.